India’s 3rd national festival, Gandhi Jayanti, is celebrated by the entire nation to commemorate the birth anniversary of the Father of our Nation-Mahatma Gandhi. 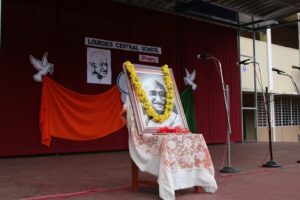 Lourdes Central School celebrated bapu’s birthday, on 2nd October, 2018, with great zeal, enthusiasm and patriotism. Sarva Dharma Prarthana: The assembly began with a special tribute to Gandhiji. A devotional ambience prevailed as the programme started with a meaningful prayer service in the form of ‘Sarva Dharma Prarthana’. 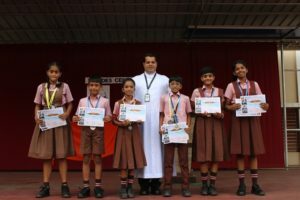 The students quoted readings from the Holy Scriptures like the Bible,Quran, Gayathri mantra and the like, giving the meaning and essence of every reading. 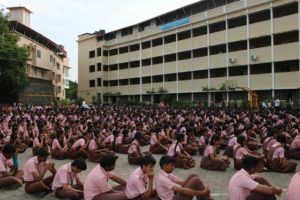 Students then continued the prayer session with a devotional rendition of karnatic prayer songs and “Raghupathi Raghava Rajaram”. Intercessory Prayers: Prayers of the little children are always heard by the lord. Believing this the students of Lourdes Central School conducted the intercessory prayers, praying for the country, political and religious leaders, the youth, the children, the school community and finally prayed for peace all over the world invoking God’s intervention in bringing about non -violence worldwide. 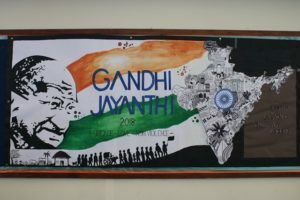 Significance of Gandhi Jayanthi: Sneha Pinto of class IXB threw light upon the significance of the day, Highlighting the various values and principles that Gandhiji stood by and used to win over the British. Highlighting peace with the harmonious formation and music were the students of the primary section through a patriotic dance and a skit on awakening Indians to fight against corruption. Students were all ears when Gandhi from the play addressed the students with an eye opener and questioned them about their patriotism. 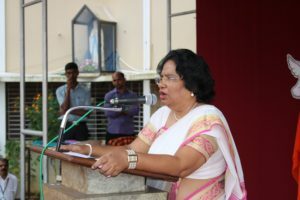 Vice-Principal’s Address: Mrs. Belita Mascarenhas, Vice-Principal took the initiative to remind the students of another freedom fighter and the one who gave the immortal slogan ‘Jai Jawan Jai Kisan’, Lal Bhadur Shastri whose birthday we celebrate on 2nd October. 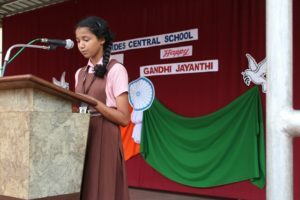 She also enlightened the students about the values of truth; Lal Bhadur Shastri emulated from Gandhiji and stood by. 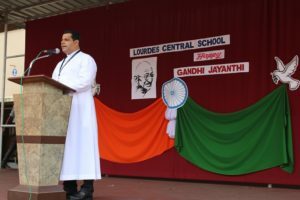 Principal’s Messege: Rev Fr Robert D’Souza, the Principal addressed the students and wished them on the occasion of Gandhi Jayanthi. He stressed on the simple living and noble thinking of Gandhi that all should emulate and imbibe in one’s life. He also insisted that the students always speak the truth and be role models. 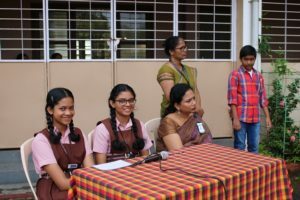 The programme was compeered by Aradhana and Shravya of class XB, Deon Fernandes of class XA welcomed the gathering with eloquence and dignity. 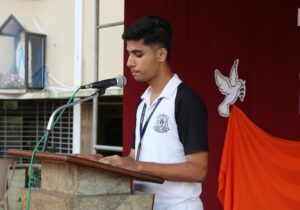 Allen D’Cunha of class 12 A proposed the vote of thanks. 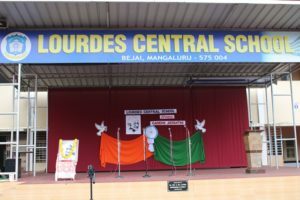 The cultural programme ended with the school anthem. 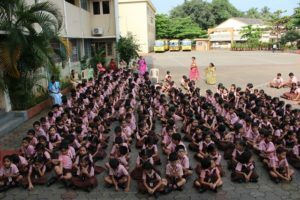 The entire school was on a cleanliness drive rendering their service to keep the school and the surroundings clean. Students from class 1 to 10 involved themselves in cleaning classrooms, corridors and school ground. 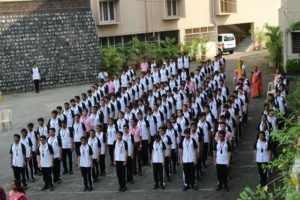 Students of class 11 and 12 pitched in their services in cleaning the school grounds in the community and places around the class. 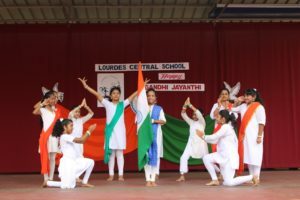 Lourdes central school took the Gandhi Jayanthi celebration to another level by including the self defense workshop in the day’s programme. Monkey Mayhem Combat Sports academy and fitness centre, under the leadership of Sachin Raj Rai and his team taught the students some self-defense like kick boxing, karate and muay Thai. Documentary on Gandhi: An hour’s documentary on Mahatma Gandhi’s Life was aired on the smart board of class 1 to12. In connection with Gandhi Jayanti, various activities were conducted for the students of class 1 and 2.The students enjoyed cleaning the racks, walls,cupboards and smart class. Action songs connected to values were shown on the smart class for the students. The class teachers briefed the students about tips on cleanliness. The students were later shown a documentary on Gandhi. All in all the students enjoyed the cleanliness drive. 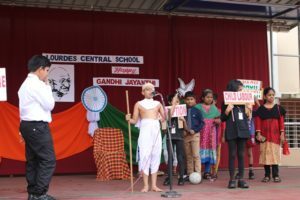 With an aim to highlight the basic education of Gandhiji and inculcate internal virtues in students, the teachers of class 3, 4 and 5 conducted various activities to commemorate the birth of the Father of our Nation. The activities included folding clothes, basic cooking skills, use of different cutlery and binding books. The students of class 4 were taught to grate coconut and also enjoyed making brooms. The students also cleaned their classrooms, racks and the verandah. 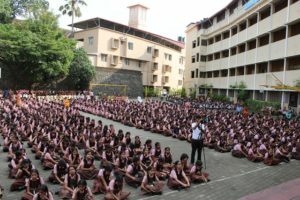 A documentary on the life of Gandhi was also shown to the students. Fr Principal then rewarded every student of class 4 with a fountain pen as they would begin writing with pen for the first time in school. 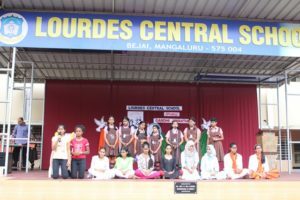 Class 6 had variety of activities in connection with Gandhi Jayanthi.The students enjoyed cleaning their classrooms. A demonstration was shown on the usage of screwdriver, spanner and lock and key. They were also taught little methods of savings. The need and the usage of First Aid Box and Emergency Medicines were discussed. Monkey Mayhem Fight Club taught the students of class 7 and 8 self defense techniques like kick boxing, karate and muay thai.They also explained the importance of sports in developing one’s mind and soul. The students took deep interest in it and the session was enjoyed by them. To celebrate the birthday of Gandhiji, various activities were held for the students of class 9.The students helped their class teacher to clean the classrooms, racks and cupboards. 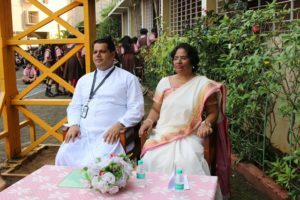 Mr. Girish briefed the students of class 9 with the safety and use of electrical equipment.The school nurse and councellor briefed on the first aid equipments and their uses.Students watched a one hour documentary on the life of Gandhiji and pre independence movements. 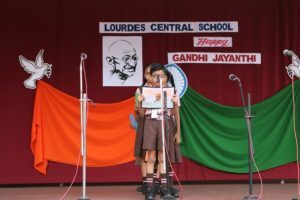 On the day of Mahatma Gandhi’s 149th birth anniversary, the students of class X gave a fitting tribute to the father of the nation. 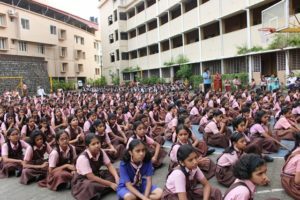 They were all enthusiastic to utilize their energy and skills for the social empowerment through work education and action (SEWA).The students followed the Swatch Bharath Abhiyan by cleaning and dusting their classrooms, corridors and windows, arranging the bookshelves and the class furniture. The students were placed in groups, handed brown sheets of paper, scissors, glue and rulers. They unfolded their creativity and presented envelopes of various sizes. 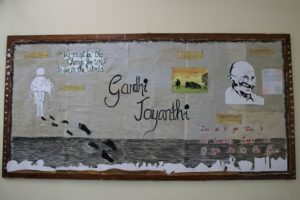 Students then went through the footprints of Gandhi, watching a documentary on Mahatma Gandhi’s Life. 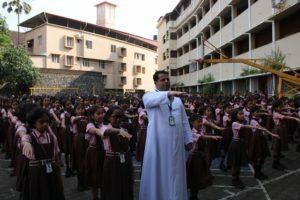 Another activity in the day’s array of activities was the self-defense workshop, where our students trained in martial arts. The day was marked by a variety of events ranging from dances and songs. 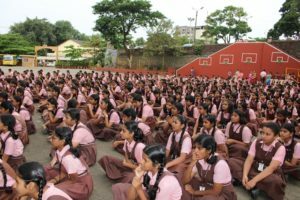 Trying to bring alive Gandhi’s vision of young India, the students of class 11 and 12 organised a cleanliness drive to clean the school ground and parking area. The students actively participated in preparing charts and decorating the school lobby. The students by doing so imbibed many values. 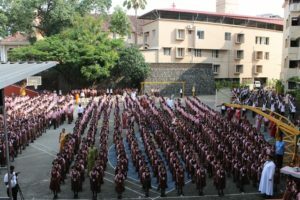 The cleanliness made the students more patriotic and developed a sense of pride in the minds of the students. 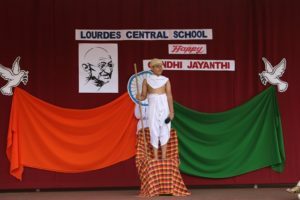 Gandhi Jayanthi 2018 at LCS was truly a learning experience and a meaningful one.